A staff (danda) is a long stick, usually made of wood, used to assist walking, for combat or as a symbol of office. 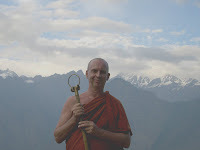 According to the Vinaya, the standard staff should be four hands (hattha) long, i.e. four times the distance from the fingers to the elbow (Vin.IV,200). The Buddha allowed monks to carry a staff when they were traveling while sick (Vin.II,131). Gradually though, all traveling monks and nuns would carry staffs. They would use them to push aside prickles, warn off village dogs and protect them from wild animals while traveling through forests. In later centuries a large metal ring with smaller rings through it was attached to the top of the staff. The jingling should made by these rings gave the such staffs their name kakkarakka which is an onomatopoeia for this sound. When I go carika (I’m getting a bit old for it nowadays) I always carry a khakharaka staff. 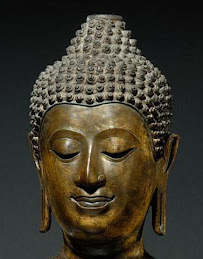 My one is an exact copy of one I saw in an Indian Buddhist sculpture dating from the 10th century. Although I carry this staff mainly for ‘sentimental’ reasons I have also found it most useful while walking through rough country and keeping angry village curs at bay. Rattle your khakharaka and they back off real quick! Eventually the khakharaka ceased to be used for practical reasons and became a symbol of authority and used by abbots during important ceremonies. The rings also became more elaborate and decorative. Senior Chinese and Tibetan monks still sometimes use such khakharakas. 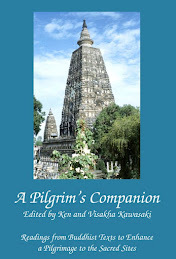 The Mahayana bodhisattva Kshitigarbha often seen as the protector of travelers, including those ‘traveling’ to the next life, is always depicted holding a khakharaka. 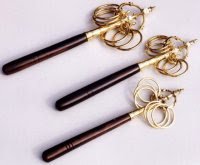 In Japan, pilgrims sometimes use miniature khakharakas called shakujou. With the development of Vajrayana Buddhism a different type of staff came into use. Called khatuan ga it had a trident on the top and a human skull through the shaft. 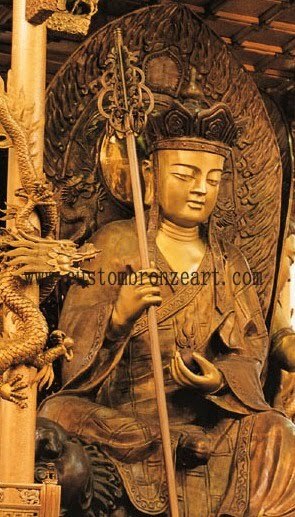 Like much of Vajrayana, such staffs were copied directly from the Hindu Sivite tradition. The trident (trishula) is the symbol of Siva and Sivite ascetics were called ‘skull-carriers’ (kapalika). Padmasambhavana, the semi-mythological magician who is credited with bringing Buddhism to Tibet is always depicted carrying one of there staffs. 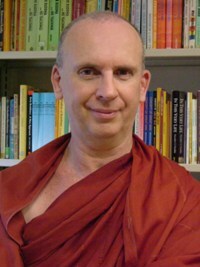 The staff has gone completely out of use in the Theravadin tradition. It is not even used as a symbol of office, a ceremonial fan serving that purpose. 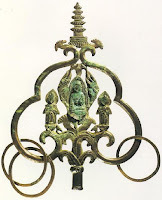 The only occurance of any kind of staff I know of within Theravada is in images of the mythological Phra Malai of Thailand who is always depicted with a simple staff. 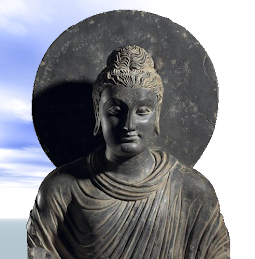 In a sense, the different types of staff illustrate the changes that took place Buddhism - from simple to complex, from practical to symbolic, and finally from a distinct separate religion to a fusing with Hinduism. 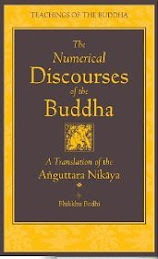 Bhante, are these at all related to the monastic fans? I want one as well, is there anywhere to find them on the internet? I really have no idea where one you would get a khakharaka from. I had someone make mine. But if you scan the interned and find one let me know.